Apple Aims To Help Parents Crack Down On Kids' iPhone Use : The Two-Way Apple will allow users to get reports on how much their kids are using particular apps on their iPhones and iPads. The announcement follows pressure from shareholders about the overuse of technology. 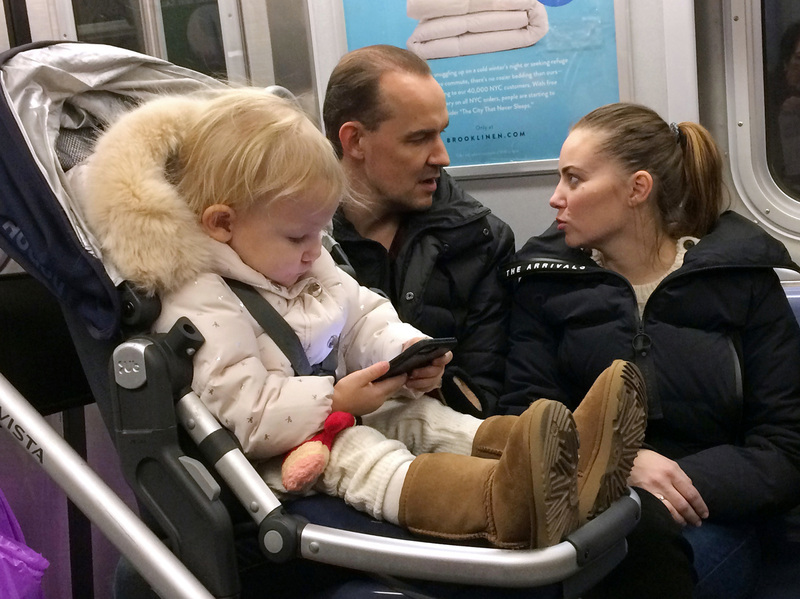 A child plays with a mobile phone while riding in a New York subway in December. Two major Apple investors urged the iPhone maker to take action to curb growing smartphone use among children. Apple is calling the app Screen Time, and it will let parents set time limits on how long their children can use apps, from Netflix to Snapchat, said Craig Federighi, Apple's senior vice president of software engineering. Screen Time would also allow parents to limit access to some apps and websites. One option is designed to get kids to unplug from their devices at bedtime. The new feature — announced at the company's annual conference for developers in San Jose, Calif. — will be part of the next Apple mobile operating system, iOS 12, which is expected out later this year. "We know, this is something that can help families achieve the right balance for them," Federighi said. In an interview Monday with NPR, Apple CEO Tim Cook said, "We have never been about maximizing the number of times you pick it up, the number of times you use it. "All of these things are great conveniences of life," he said. "They change your daily life in a great way. But if you're being bombarded by notifications all day long, that's probably a use of the system that might not be so good anymore." Apple also launched a "Families" webpage in March, outlining ways in which parents can utilize the company's pre-existing features. "We first introduced parental controls for iPhone in 2008, and our team has worked thoughtfully over the years to add features to help parents manage their children's content," Federighi said. Apple's announcement Monday follows pressure from activist shareholders to take the lead in developing controls to help parents limit iPhone use by teens and children. In January, Jana Partners and the California State Teachers' Retirement System, or CalSTRS, wrote a letter to Apple about growing "societal unease" about overuse of technology and in particular smart phones, which at some point could turn people away from buying Apple products. They called upon Apple to take a stronger role in helping parents control their children's use of electronic devices. CalSTRS and Jana, which, combined, owned about $2 billion in Apple stock, say the company could help minimize "unintentional negative consequences" of overusing digital devices and spending too much time on social media. Charles Penner, a partner with Jana Partners, said the investment firm sees Apple's latest moves as positive. "We're still reviewing it, but Apple appears to have addressed the vast majority of our concerns, and we look forward to seeing their follow-through," Penner said. One study by nonprofit group Common Sense Media said that 78 percent of teens check their phones at least hourly and 50 percent report feeling "addicted" to their phones. Monday's announcement addresses some of the concerns of the shareholders. Apple's initiative is the latest push from technology companies under pressure to address smartphone addiction. "We need to have tools and data to allow us to understand how we consume digital media," Tony Fadell, a former senior Apple executive, told Bloomberg in May. "We need to get finer-grain language and start to understand that an iPhone is just a refrigerator, it's not the addiction." Google announced similar controls in May for its Android P operating system, which include expanded do-not-disturb controls and ways to track app usage. Google introduced a "wind down" mode that changes the screen's brightness and color scale later in the evenings. The new software will also allow users to set time limits on apps, similar to what Apple plans to roll out.